Don't let the aesthetics fool you. This is a neighborhood bar in disguise. With its plush furniture and hanging chandeliers, The Mitchell looks too fancy to be friendly—at first. But you might be surprised to find that this Downtown Dallas hotspot is just a homey neighborhood bar in disguise. Opened earlier this year, The Mitchell serves up gin cocktails and elegant snacks in a stylish but comfortable setting. Although the narrow space’s decor is luxurious and elegant, you’ll find different types of patrons. 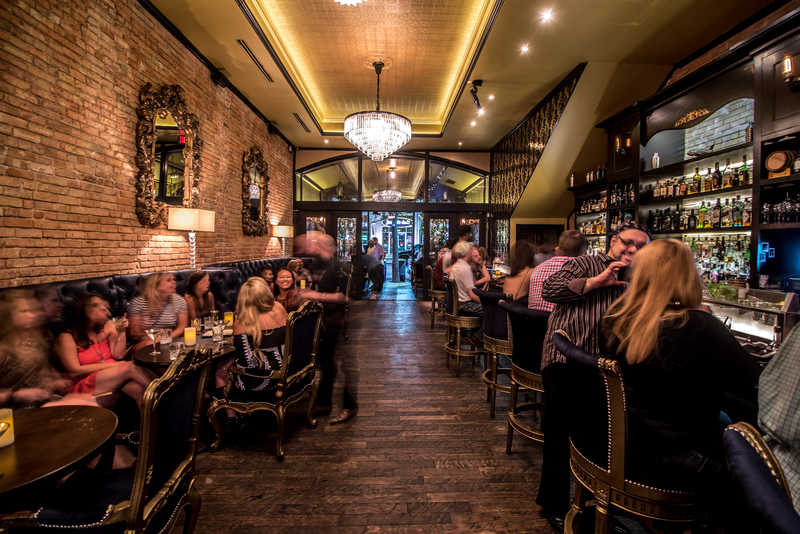 Atmosphere: The Mitchell is a narrow but well-lit space, with exposed brick on one side and gold damask-patterned wallpaper on the other. There’s a long, gold-embellished banquette that runs parallel to the bar, which offers plenty of seating in the way of fancy blue-gold bar stools. Sparkling chandeliers hang overhead, gold-framed mirrors adorn the walls, and at the head of the room is an alcove for live music. Even the patio is luxurious, with fancy studded chairs fit for French royalty and hanging lanterns. But despite the elegance, upbeat rock music plays overhead, and the dressed-down bartenders make everyone feel welcome. What to Order: A good gin cocktail is hard to come by, and The Mitchell offers a few: order a Berry Mint Bramble ($10, Bulldog gin and Mathilde Framboise liqueur) or the Last Word ($12, Tanqueray Bloomsbury gin, green chartreuse, and Leopold Bros. maraschino liqueur). The Mitchell’s cocktail style is simple but classic (and classy)—there’s nothing too over-the-top here, and you’ll find a handful of your favorite go-tos, like the Old Fashioned and Negroni. For dinner, the Mitchell offers oysters, croissants, and even beignets. The Mitchell’s bartenders add to the bar’s friendly demeanor. Who’s There: I spotted women in sundresses having a ladies’ night out, close-talking couples, groups of friends, and at least one T-shirt-clad guy who’d come for dinner alone. Despite the upscale look of the place, the crowd wasn’t particularly dressed up (I didn’t spy a single suit jacket or pencil skirt) and seemed relaxed, comfortable, and unpretentious. The two bartenders—a tattooed woman in a plaid shirt and a young man in a ball cap—were friendly and talkative, despite being swamped. 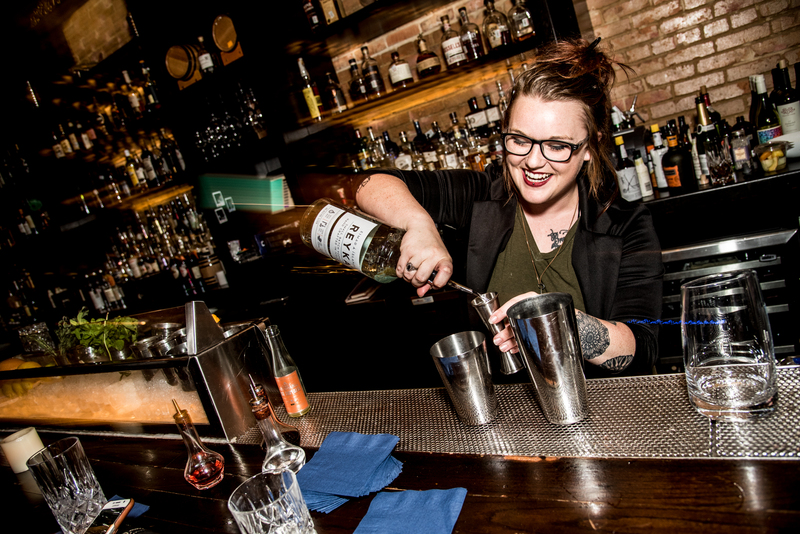 When I remarked on The Mitchell’s fancy factor, one of the bartenders told me that they aim to welcome everyone—“We’re not going for a ‘you-can’t-sit-with-us’ vibe,” he told me. 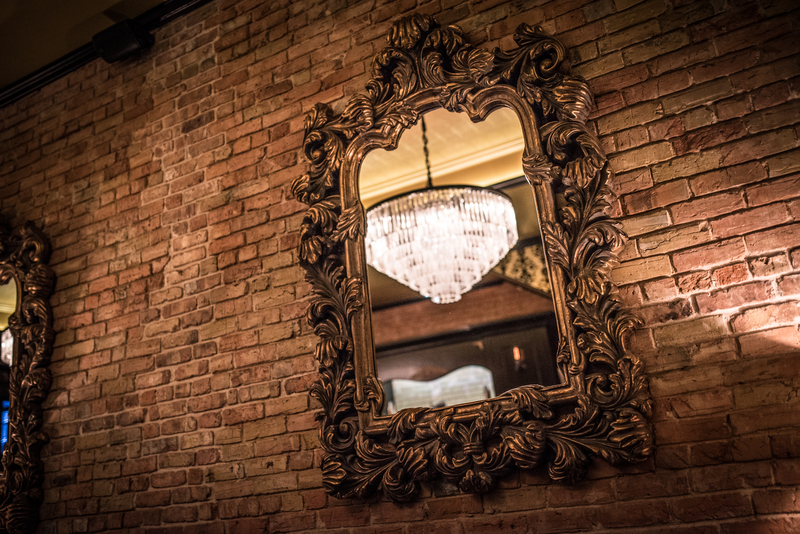 You’ll find sparkling chandeliers overhead and gold-framed mirrors on the walls inside The Mitchell. What I Didn’t Like: The front door opens right between the bar and the table seating (it’s a narrow space) and it’s so brightly lit that there’s no way to casually wander in without everyone noticing you. I tend to prefer low-key entrances. What I Did Like: There is a fancy, plush, kingly chair, better than all other chairs, that sits in the live music space when no one’s playing. I want it.